This weekend combines camp service with a social opportunity. 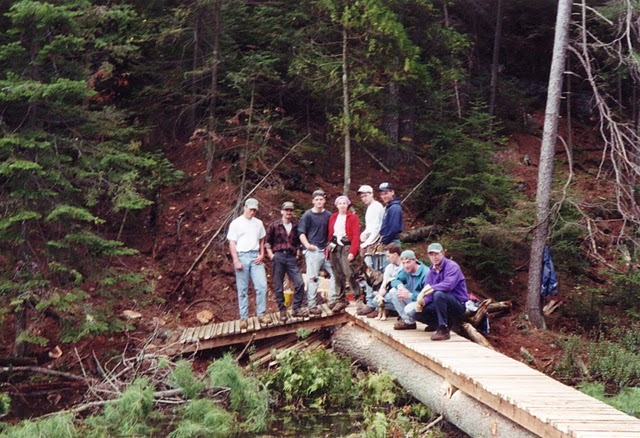 Each fall, a large number of Alumni gather at camp to clear, renovate or rebuild some of the 35 km of hiking trails at HSR during the day and renew old friendships each evening. Finished Product – to last 14 years. 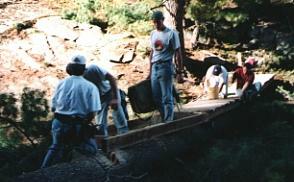 During the September 1996 weekend, twenty-five Alumni built a brand new, sixty foot bridge across Pee Pond to replace the previous route over the crumbling beaver dam. 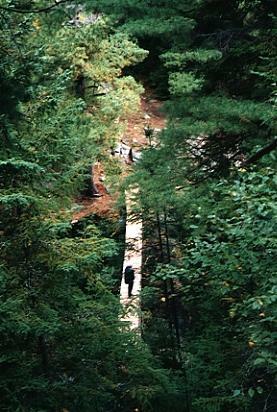 Although the base was built from two large pines felled at the site, all the lumber for the runners and decking had to be carried in from Moore Lake to Pee Pond. Thanks to John Pollock (?-96) and his father for arranging donation of lumber for the decking. There was also maintenance work done on the Pike’s Peak and J.C. Trails. Thanks to all for their hard work including those who laboured in the kitchen to feed everyone! This entry was posted in Trail Weekends and tagged bridge, pee pond, trails. Bookmark the permalink.